The Amherst co-ed ice hockey team had a record of 16 wins and 5 losses, in yet another great season. 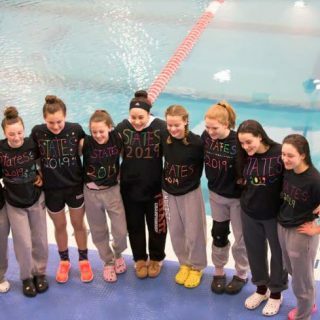 Though they lost in their playoff game for the Western Mass championship on Saturday March 2, 2019, they were proud of their season overall. Senior Gio Rivera said that the team has players from throughout the region, including Palmer and Hadley, among other towns. The Amherst players are Rivera, senior Jared Cutting, junior Eli Slovin, sophomore Justin Masteralexis, and sophomore Graham Goodhind. Anyone can try out for the team, and this team has boys and three girls on it. Eli Slovin Junior said there are many standout athletes. “The best are Jaden Blackburn, a sophomore from Palmer, who led the league in points this year, and Nick Foster, a Hopkins junior on defense,” said Slovin. The head coach Mike Russo (a teacher at ARMS) always preaches mental and physical strength and also team bonding. At practice, the team usually starts with a nice warm up, which includes lot of shooting drills for the goalies. Then, they move into systemic work on their breakouts, power plays, and anything they need to prepare for their next game. The team practices every day of the week, usually right after school, at Orr Rink at Amherst College. “During the season, I’m with my teammates probably more than anyone else,” said Slovin. The team has a group dinner before every game and they like to go to a lot of UMass hockey games. They also have a group chat on snapchat “which is pretty live” said Rivera. They like to make smaller incremental goals and work their way up on the list. The team is very young but that does not hold them back in any way. This mentality creates a really exciting brand of hockey for the fans to watch. One of the Hurricanes’ most important games was the first one of the season. They were playing the former Western Mass champs Easthampton. The Hurricanes were down 2-1 in the beginning of the third, then they scored a goal to tie it up. Eventually, they scored again in the last second of the game to win. “That game set the tone for the rest of the year,” said Slovin. Both Slovin and Rivera have been playing for over 12 years. Both Slovin and Rivera plan to play after high school but not at the college level. “I’m sad to see [my hockey career] come to an end. It feels like it was just yesterday I was in seventh grade practicing with the high school and here I am today heading into my senior season,” said Slovin.